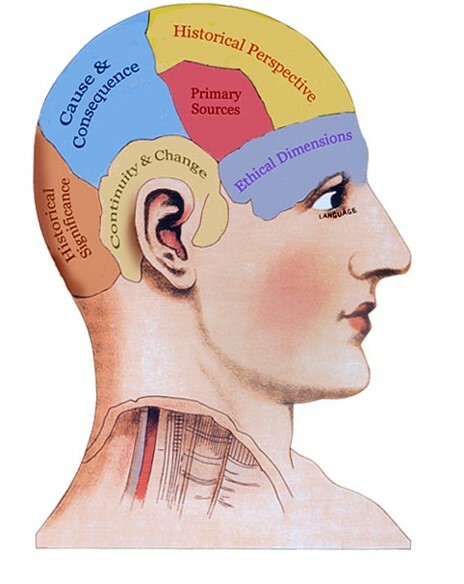 Articles: How to Think Strategically – Page 2 – Tools for strategic and strong-minded thinkers! All students of strategic thinking occasionally feel just a little lost and frustrated. I imagine the topic of strategic thinking as a map – albeit a fuzzy and dynamic map – with salient landmarks that help you navigate through the subject. Even with the best of maps, you can find yourself wandering about when you’re in the field for the first time. Fortunately, with experience, the landmarks seem familiar and expected. The exploration seems more natural. What other landmarks are relevant? 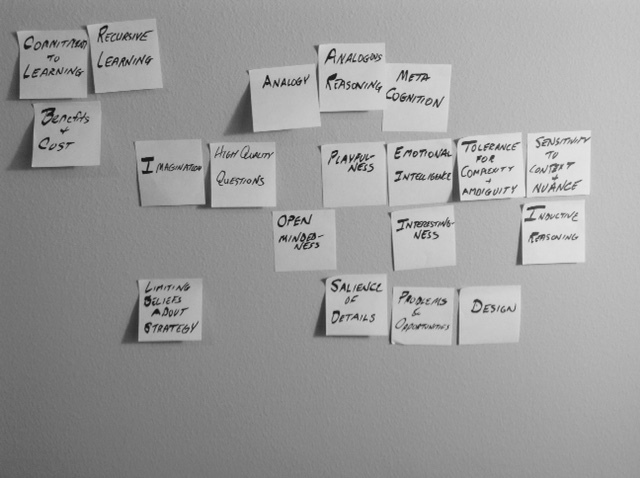 An orientation cue helps you locate your position on a larger field of concepts. 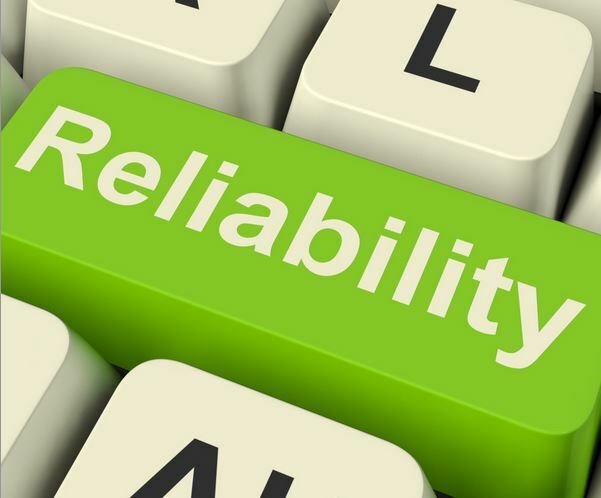 Too often, people look for “best practices” on the basis that the external environment is predictable and obvious (which it is not). Instead, a strategic thinker will be sensitive to nuance and relationships. I like Dave Snowden’s Cynefin framework. It takes as a starting point the idea of disorder and diagnosing whether you are in a simple system (causes and effects are obvious and linear), a complicated system (an expert is needed to analyze and design a solution), or a complex situation (the ultimate solution will emerge and each experts brings a distinctive view of the problem). Pay attention to the current discourse; the conversations you are having with your colleagues as well as with your internal thought process. If the conversations are about productivity, quality, and efficiency, then you likely to be practicing operational (rather than strategic) thinking. A navigational beacon gives you a point to navigate towards. When you lose sight of a navigational beacon, you practice a kind of “dead reckoning” towards the beacon, making course corrections when you sight the beacon. The two most useful beacons of strategic thinking are the future and success. 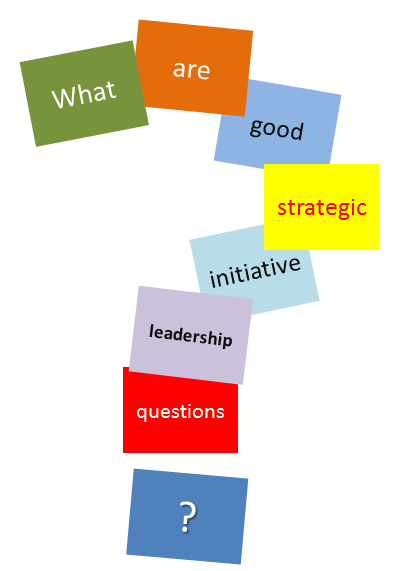 By definition, strategic thinking is concerned with “success in the future.” Does your organization have a diagnosis of its strategic situation and policies for addressing that situation (these are essential elements of good strategy)? What threats and opportunities are present? How far into the future are you looking? What metrics are you using beyond basic financial measures? An associative cue is an object or concept that contains useful navigational information. It helps you know what to do and what to think about next. In the past, I’ve written that insights are the secret sauce of strategy, so they are an example of an associative cue; when you have an insight, you should consider their use in the design of strategy. Another tip for associative cues in the strategic thinking map is to stay attuned to the emotional tenor of the discussions: Are people feeling frustrated? Tired? These would be cues to approach the strategic situation with a fresh perspective. Finally, the search for associative cues gives us a way to build the reflective competence essential for developing competence in strategic thinking. What patterns have you observed? Notice the number and nature of the questions that have been posed. If you are reflecting on the specifics of your situation, you’re not thinking strategically. 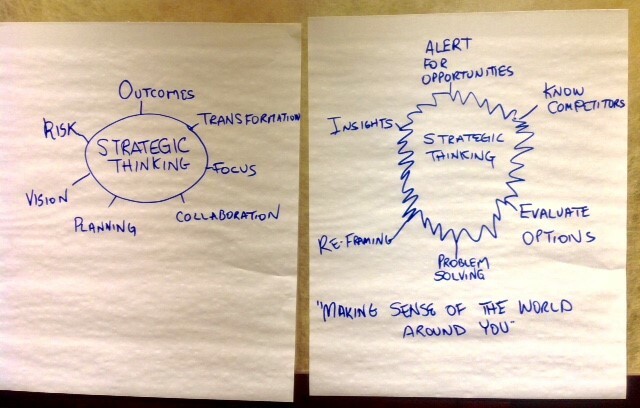 What other examples of beacons and cues might be found in a strategic thinking map? One of the most powerful tools in the strategic thinker’s toolbox is the ability to pose high-quality questions. A high-quality question is better than a good question. What is interesting about what is going on here? How are power relationships changing? What relevant things are being overlooked by most people? What are patterns in the evidence and what assumptions being made about those patterns? What are the future implications of what we see today? Good questions are conversation starters, but they don’t typically encourage answers that are specific to your context and to your ability to secure your fundamental interests. Above, I made a good question better by adding some of the specifics of strategy: interestingness, power, overlooking things, patterns, and future implications. Here is another example: A good question is to ask about strengths and weaknesses. A better question (and one of my favorites) is, What could your competitor do to put you out of business? A high-quality questions points you towards insights that are specific and meaningful to your organization. Good questions are conversation starters, whereas high-quality questions require and provoke deeper thought. Do you agree? The most important, critical activity of strategy making is that of diagnosing the situation. A mistake in diagnosis will lead to poor strategy and results. 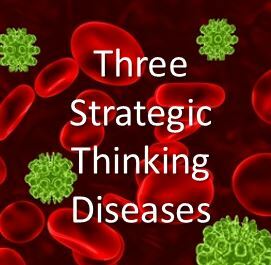 This article describes three shortcomings that get in the way of good strategic diagnosis. I found them in Daniel Kahneman’s closing remarks in his book, Thinking Fast and Slow. Anchoring – We’ve all experienced anchoring when in bargaining over price. Someone offers a price, and the agreement settles someplace near that price. Anchoring is common in establishing project due dates and budgets; those initial anchors may be totally infeasible! The mind gives disproportionate weight to the first information it receives, regardless of the realism of that information. Here’s an example from earlier in my career. My employer had experienced two very good years of growth, and the prior year our sales were up 35% over the previous year. The CEO entered into a planning meeting and said this, “We grew 35% last year, so our target growth for this year is 35%.” Anchors like this are intuitive, and ignore relevant factors like industry growth rate, competitive responses, and the state of the economy. Here’s another example. At the time of Wal-Mart’s founding, the conventional wisdom was that a full-line department store needed a population base of at least 100,000. Sam Walton was able to buck this conventional wisdom by redefining the business as a network of stores with an integrated supply chain. Related to conventional wisdom is the concept of a “best practice,” which leads to thoughtless copying of others. Seldom does a good strategy arise from copying the practices of others. Narrow framing – Humans put boundaries on problems, whether they recognize it or not. When a person frames narrowly, they bring their attention to an isolated part of a situation. When people narrow frame, they tend to look at their own situation fail to appreciate their interactions with others. Narrow framing is the opposite of holding a big picture. As an example, Kahneman described the experience of his colleague Richard Thaler, who was meeting with a group top managers of 25 divisions of a large company. The CEO’s broader frame allowed him to make a decision that implicitly understood that the gains would cancel out the losses and shareholders would do better. The division managers naturally had a risk-adverse mindset; the problem came when each narrow framed on their own condition instead of elevating their perspective. Many incumbent organizations have stagnated. This is because localized decisions lead to conservative decisions. Opportunities are missed. By contrast, competent strategic thinkers are aware of the difference between narrow and broad framing and strive to continually analyzed decisions through risk policy that benefits the whole. Strategy itself can be thought of a centralization of certain policies that create impact across the entire organizational system. Excessive coherence – The idea that strategy is a plan is another way to say that the various elements of a strategy “make sense.” Coherence is the characteristic of a story that indicates that it “hangs together” in the memory so that it seems natural and logical. Excessive coherence is when a person reads too much into a situation, finding causes and relationships where none exist. Excessive coherence explains the halo effect where jump to conclusion that a particular person has extraordinary powers because of their affiliations or past successes. Most people are familiar with the concept of groupthink where an entire group convinces themselves of the correctness of a strategy. Group social norms – a kind of social coherence – provides reinforcement to the story. Overconfidence is one of the biggest flaws in strategic thinking. Excessive coherence, that is, belief in the story, leads to overconfidence. Instead, competent strategic thinkers look for disconfirming evidence and alternative explanations for those signals that are ignored by others. What are shortcomings should we be aware of? Knowing History: A Strength or Weakness of Strategic Thinkers? We are left with the impression that history is inevitable, that what happened could not have happened any other way, and that drama and contingency have no place in the general scheme of human existence. Superficial knowledge of events and characters is fine for entertainment, but dangerous if we need to problem solve and create policy. Deeper understanding of the past is needed if we are to make decisions about the future. Many people enjoy a good historical narrative, but knowing the historical facts does not translate into strategic thinking talent. This is because most histories are written as coherent stories of conflict and competition. The resolution is frequently narrated so that the outcome seems inevitable. Further, most accounts of history severely discount the role of chance. A frequent reader of history comes to accept personal character as vitally important, and overlook chance. This historical-thinking mindset hinders their ability to make futures-ready decisions. I know several people (all men) who enjoy reading history books about great historical leaders, wars, and movements. They describe it as an enjoyable hobby. These histories provide coherent, consistent, logical narratives. These same people are among the first to criticize leaders of business and government. I’ll illustrate this with Terry who I’ve known well for 20 years. Terry is an avid history reader and is intelligent. When it comes to contemporary affairs of business or politics, though, Terry will frequently criticize with comments like, “they have no commonsense” or “they’re idiots and don’t know what they’re doing!” In the spirit of having a good conversation, I try to get Terry to see if there is room for another point of view. I point out that situation is complex. I suggest that maybe the policy might have benefits that will become more obvious in the future. Usually, my words have little impact. Terry has determined all those business leaders and politicians (it doesn’t matter what political party) are incompetent and it’s settled. Luck plays a large role in every story of success; it is almost always easy to identify a small change in the story that would have turned a remarkable achievement into a mediocre outcome. Forecasting & Plans: Is the Future Inevitable? When you believe that “history is inevitable,” you’re also more likely to rely on trend forecasting. If there was a 10% change in a variable over the past year, you’re likely to assume that this same 10% will apply to the coming year. Your mindset is anchored to a number, and the status quo is often the result. A similar idea characterizes planning. People create plans as if they will unfold in an inevitable way. There is little consideration for the role of chance. Historical thinking involves reading the works of other historians. As an element of critical thinking, you critique the choice of evidence, the framing of that evidence, the tone and word choice, and the resulting conclusions. Instead of the inevitable “march of history,” historical thinkers look for alternative “second stories” that might equally explain the past. Strategic thinkers understand that surprise, contingency, and deviation from trend lines is the rule and not the exception. Context matters. Strategic thinkers explore alternative possibilities of what might be, rather than definitive predictions of the future. A good historical analysis, like good strategy, probes into deeper layers. Do you agree that knowing history does not mean you are a historical thinker? Do you agree that a superficial knowledge of history is a detriment to strategic thinking? What are the strongest and weakest parts of my argument? From the introduction to What If? 2: Emininent Historians Imagine What Might Have Been. 2001. Berkely Books. A History of the Future. David J. Staley. December, 2002. History and Theory.